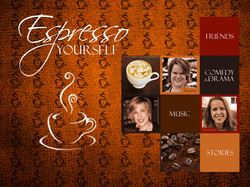 If you enjoy a lively chat between girlfriends, grab a warm beverage and get ready to Espresso Yourself. Based out of Minnesota, this three-woman troupe offers two affordable, 60-minute presentations with a satisfying mix of teaching, comedy, music, and drama sketches. Served up especially for community and outreach women’s events for groups both large and small! Or package them together for a retreat! Three friends gather around a cafe table and invite the audience to join them on an uplifting, heart-warming journey of discovery. Women of all ages will be inspired to embrace their purpose as they ask, “What’s the next step God wants me to take?” From relationships to professional goals, home life to who we are in Christ, they’ll learn to recognize the stirrings within. 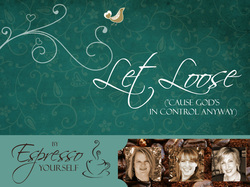 Ladies, grab a cup of java and let's just get it all out on the table! We try so hard to be in control of every part of our lives and neatly manage who we're "supposed to be." But the more we try to be in control, the more we feel out of control. Maybe that's right where God wants us to be. When you can let loose enough to depend on God, He can do his best work through you!